The Purple Journal | …posted from the United Arab Emirates. I’ve moved to my new home! Click here for a magic carpet ride that will take you there. See ya! It’s a beautiful day to explore a deserted town rumored to be abandoned years ago because it was haunted. A town that is also rumored to be off-limits because it is private property, but there is no sign anywhere to justify this, so people still trespass enter. And it is also a town that is a favorite among photographers. 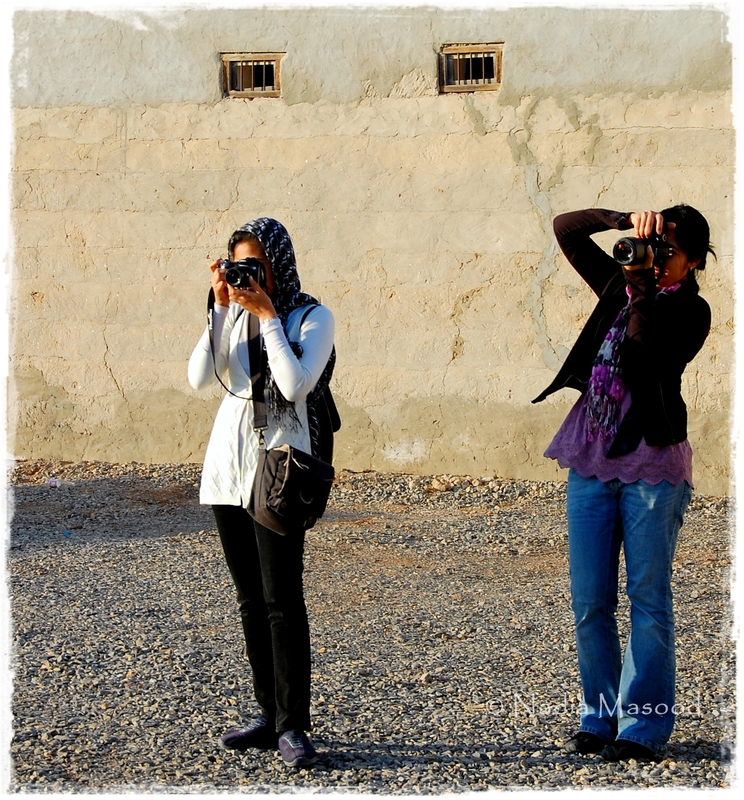 And being photography enthusiasts ourselves, we waste no time to hop in our cars and drive all the way to Jazirat al-Hamra, or the Red Island. So while we are going through great lengths trying to capture each and every broken door in town, someone from the group decides to shoot us photographers instead. Photographers, you see, are highly dedicated individuals who get so absorbed with their work they barely notice that the building might come crumbling down on them any minute. 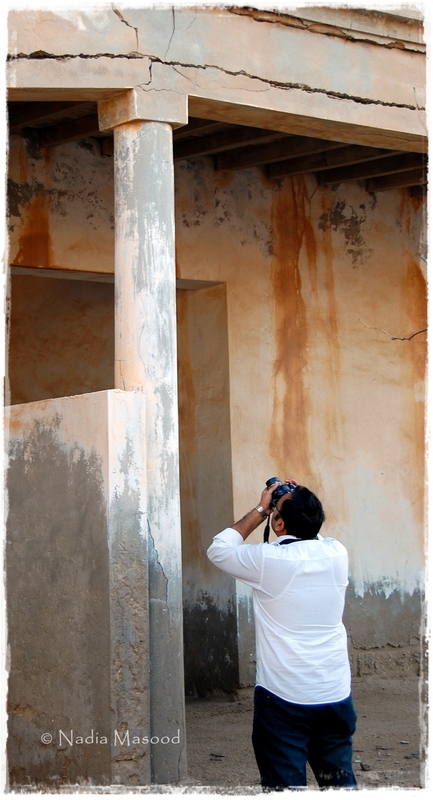 To a photographer, a wall is never simply a wall, it’s beauty. It’s art. Yes, we all ended up posting pictures of the same walls, doors, bricks and windows up on our Facebook accounts where we all have common friends, so they see each and every piece of this town at least a dozen times. Allow me to once again tell you this important piece of advice: a wall is never just a wall. And they will press the ‘like’ button when you post that picture. 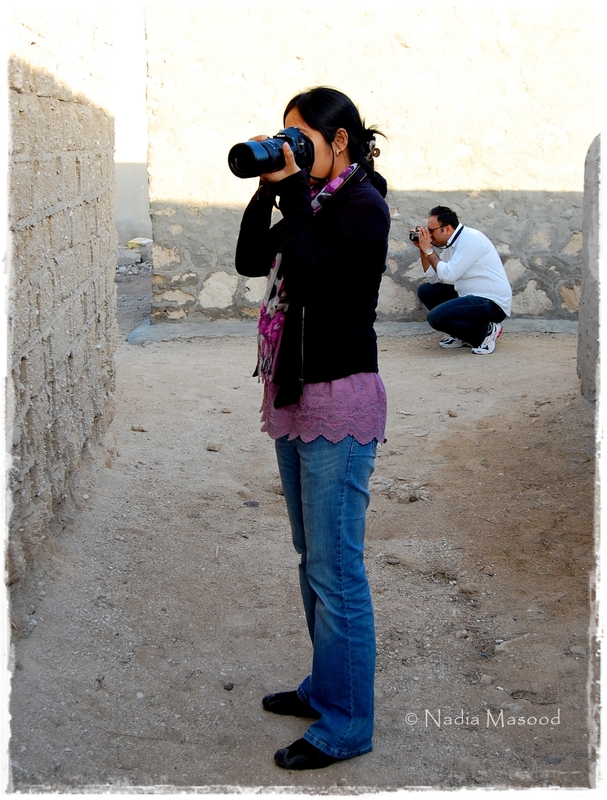 I like the idea of shooting photographers in action; the unsuspecting ones, that is. I think I’ll post more behind-the-scenes pictures of how we take the pictures that I post on this blog. Would you like that? 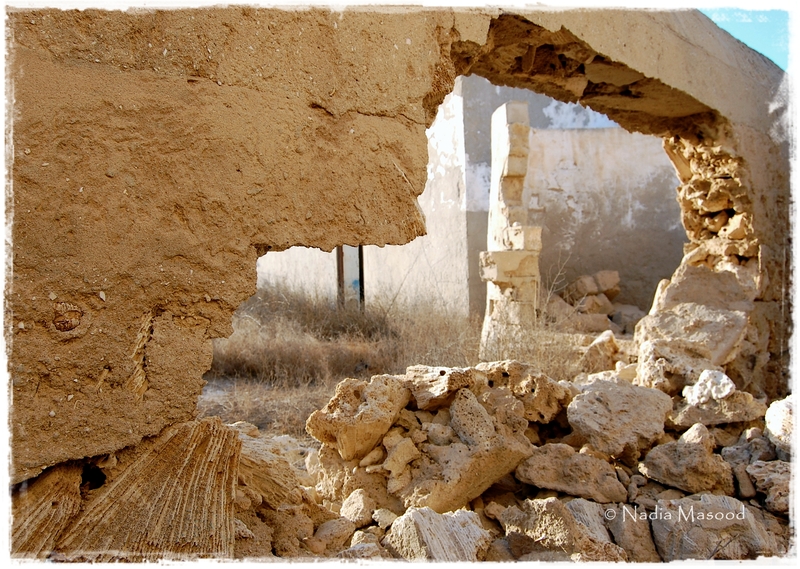 One look at the seclusion and crumbling walls across the main road tells us that we have arrived at the right place. It’s a couple of hours before dusk; we have some time to explore the area before it eventually gets dark. We park our cars right in front of a fort that watches over narrow alleys and abandoned buildings in eerie silence. A sister of mine knows some people from a photography club. It is through them that we came to know about this town. 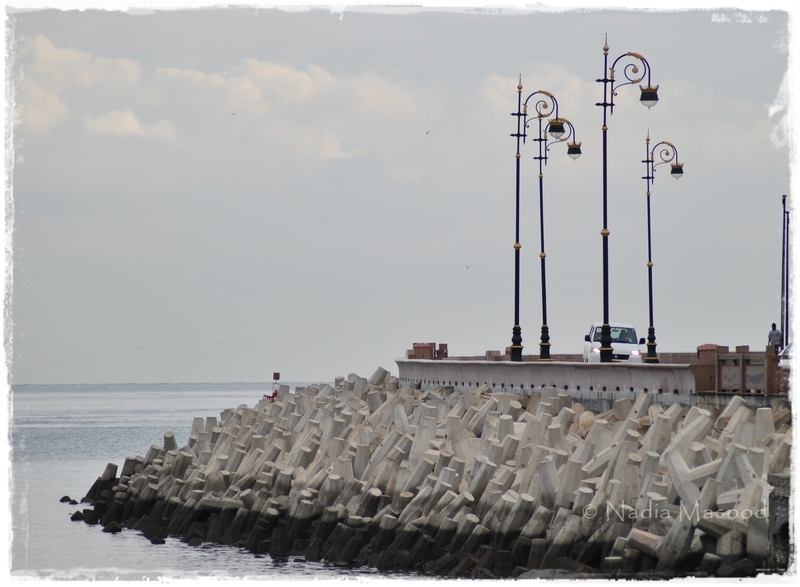 It’s a weekend, and not having any other plan, we decide on visiting this place for some photography fun. The breeze is chilly. There is labor camp not so far away. We see a couple of men walk past us carrying firewood on their heads. When they left, there are only the eight of us remaining in the area. I look up; a few fluffy clouds are scattered on a very blue sky, and a few birds fly overhead. 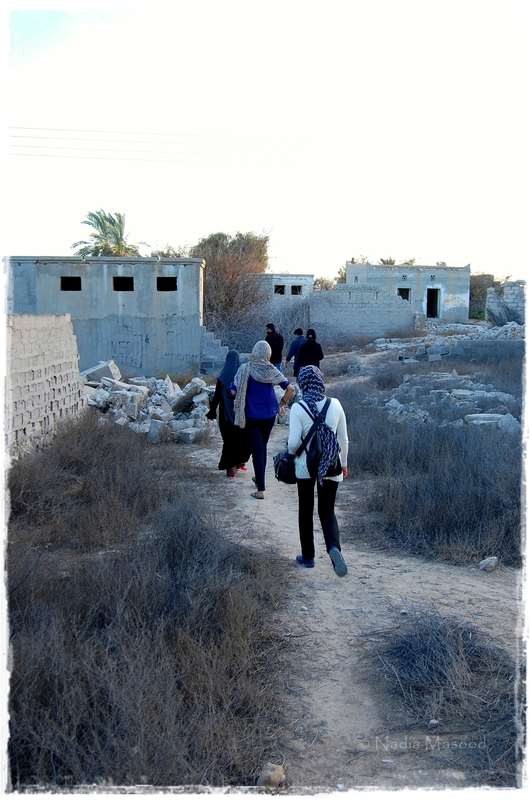 We pick up our cameras and start walking towards the quiet town. 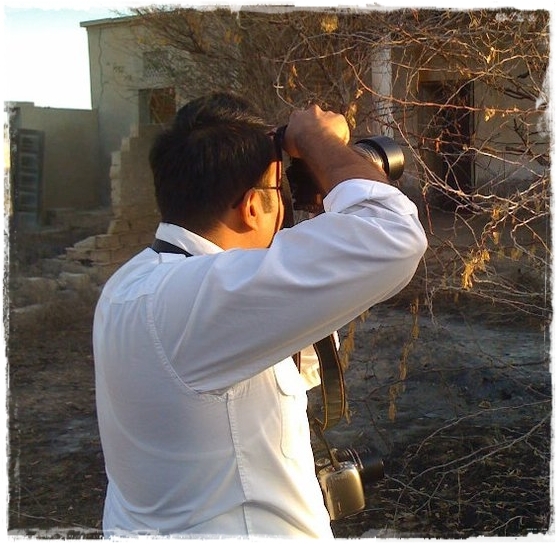 This place is Jazirat al-Hamra, or the Red Island, located in Ras al Khaimah, one of the seven emirates that form the U.A.E. It is also known as the ghost town. 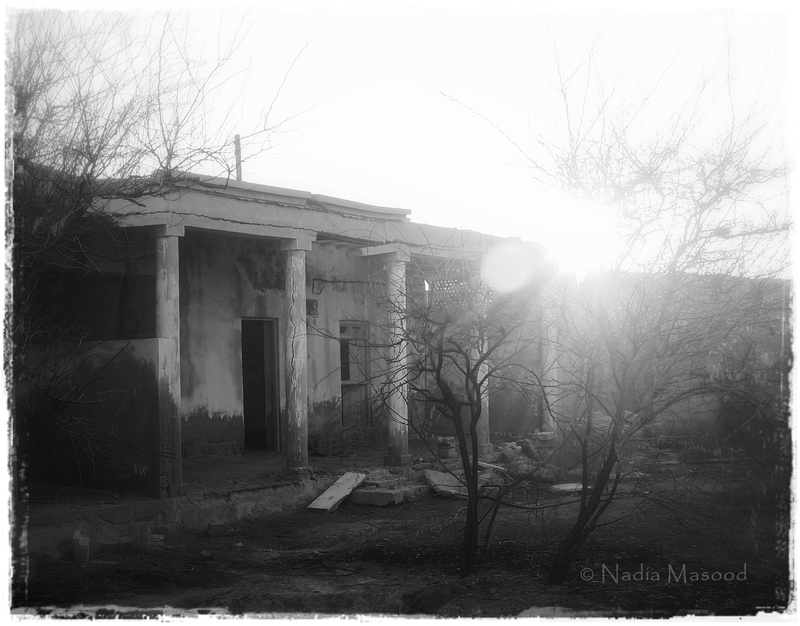 The story goes that this town was haunted, which is the reason why it was abandoned, and has remained uninhabited and neglected since 1968. The main paths meander through this village—passing by mosques, and houses with features like wooden doors, star windows, wind-towers, and courtyards—towards the sea. However, all of these structures lie in varying degrees of decay. 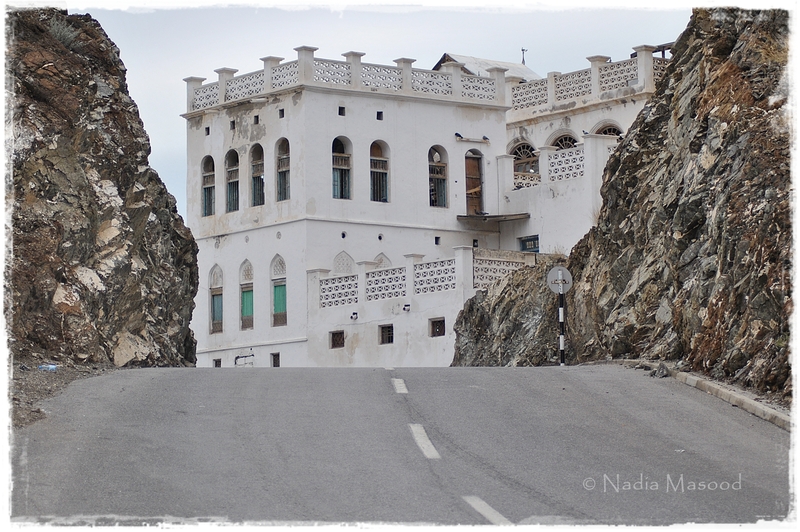 Occupied by the Za’ab tribe, this coastal village was created in the 14th century on a peninsula. 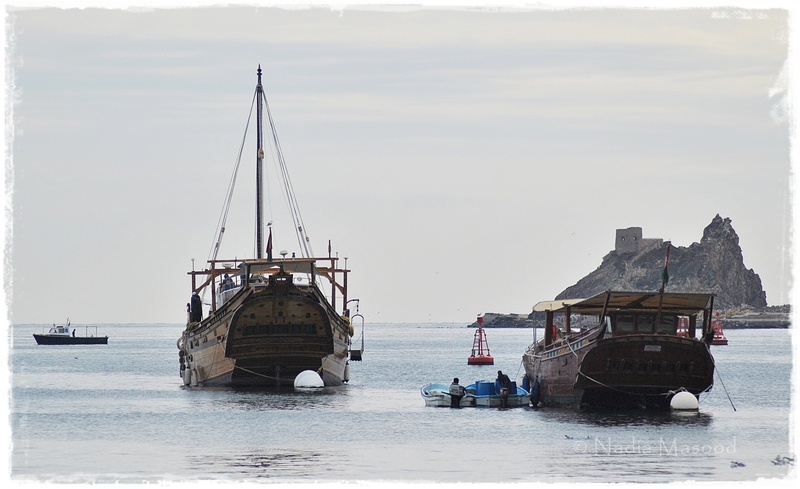 They were also called Hadhr, which is the local name for coastal Bedouins, whose livelihood depended mainly on pearling. The 1930s economic crises saw the decline of the natural pearl industry. Few years later, this town was deserted when the inhabitants moved out, attracted by the prospect of better living conditions offered by the local government. People left behind their houses, mosques and shops, creating what now is an undisturbed picture of life before the exploitation of oil. It is said that the house shown above belonged to a very wealthy merchant. I have not walked past the house to see the other side, but I heard that there is a huge courtyard in front of the house. The mud-and-brick wind towers were designed to funnel even the slightest breeze off the Gulf into the house. But what I find really interesting while roaming around the deserted town is how corals and sea shells were incorporated with stone and mud to create the walls. Most of the houses were built from coral rag, the roofs were constructed from palm trunks. 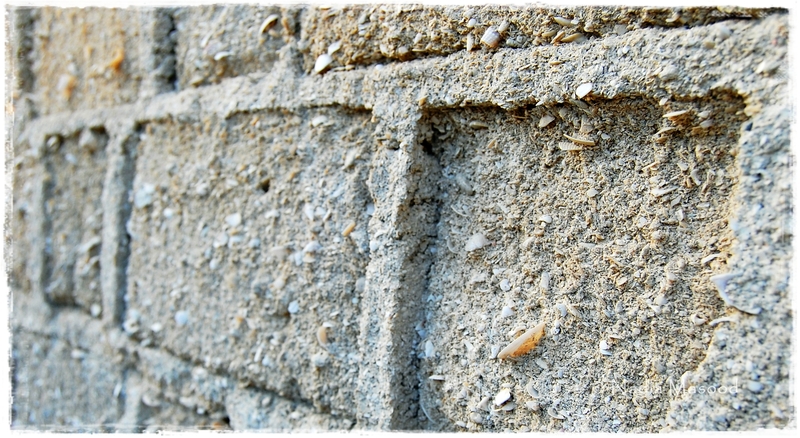 The walls of the oldest buildings have larger pieces of coral, while the younger once were built from bricks of crushed coral. This town is so famous for being haunted that different people have different stories to tell. A nephew of mine—very charming and naughty—said that he once came to this town with some of his friends. They drove into the town and decided to stop in front of a big house. Some of them started to smoke cigarettes and chat. 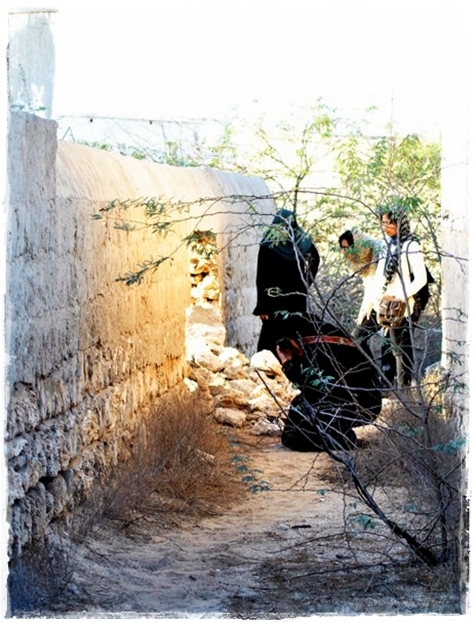 Few minutes later, they looked down and noticed that there were actually graves right at that spot! We walk around town but do not find any graves. A few journalists even decided to spend the night here hoping to encounter whatever is rumored to be living in these decaying structures. Although incomplete, their ‘live’ update was featured here. This is the courtyard that I find the most impressive. We stand there for a few minutes trying to imagine how lively this place must have been years ago. As you can see, the pillars look like they will come apart anything soon. Someone had a recent bonfire around here, the soot scattered right at the center of the courtyard. Do we ‘feel’ anything at all? No. My sister even remarks that the town has no fear factor at all. 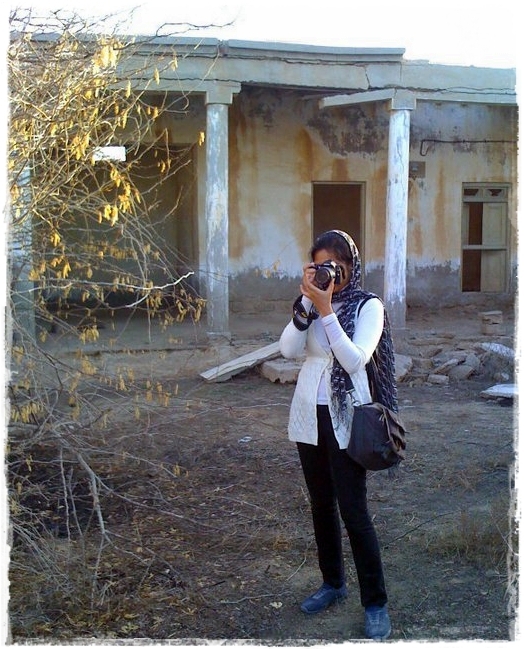 We comfortably pass through the alleys, stopping in front of houses to take pictures. Once, I enter the fort to take pictures from inside, but there is this uncomfortable feeling—like I’m trespassing or something—so I decide not to enter any other building. Photographers frequent this place. One can spend hours roaming about, taking countless pictures. This is also a favorite amongst fashion photographers. We quickly walk back towards our cars when the sun begins to set into the horizon. 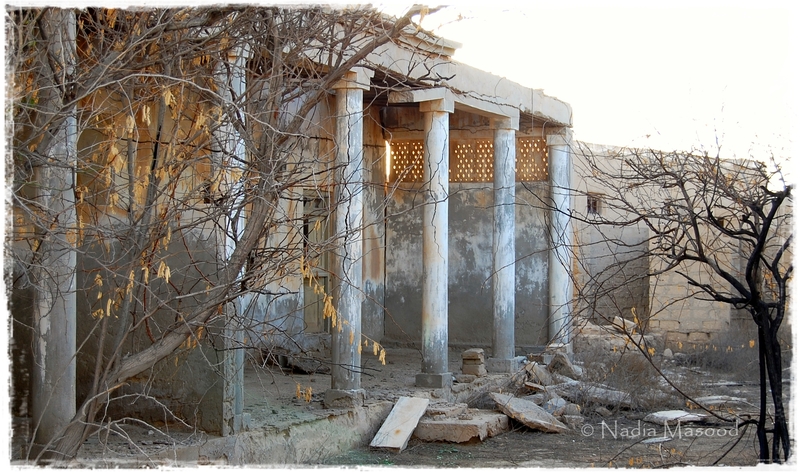 Although we do not encounter anything spooky, it is believed by a lot of people that there are jinns who live here, and they usually come out at nightfall. We are not interested to meet them, so we leave. 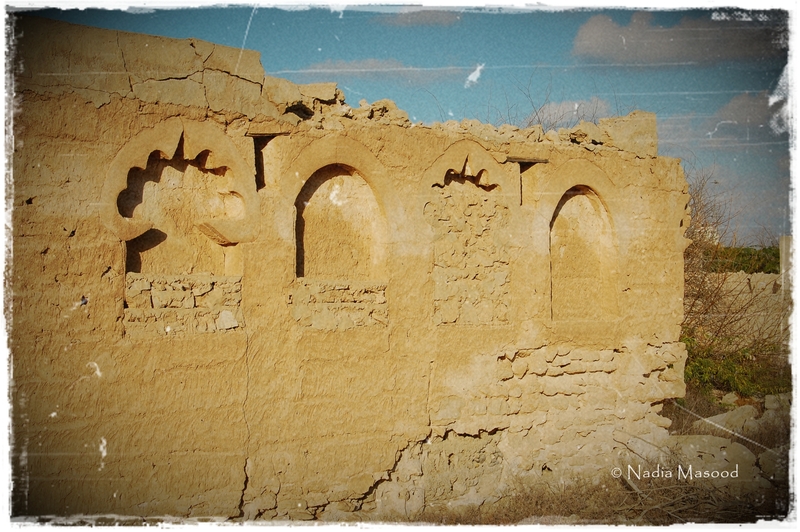 Jazirat al-Hamra may be a ghost town to many, but for me it is an amazing piece of history. 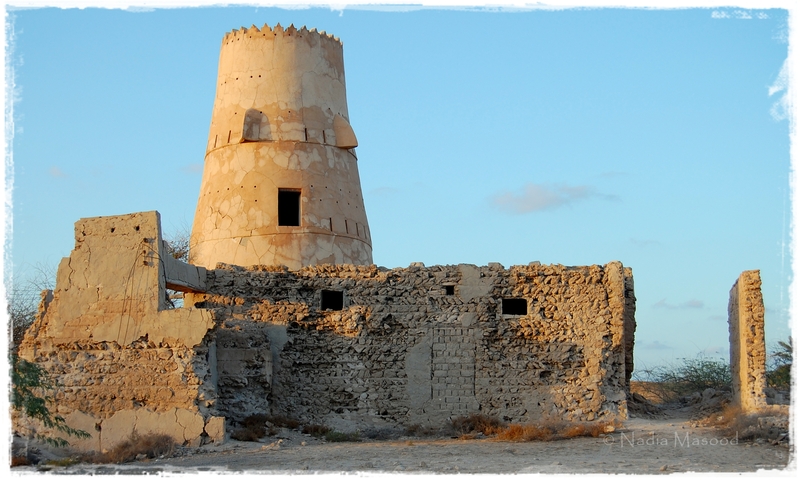 It is also the last authentic and traditional town still standing in the U.A.E., and if the government does not do anything to preserve it soon, it is going to perish forever. Some say that this place is off-limits, but I do not see a sign anywhere. 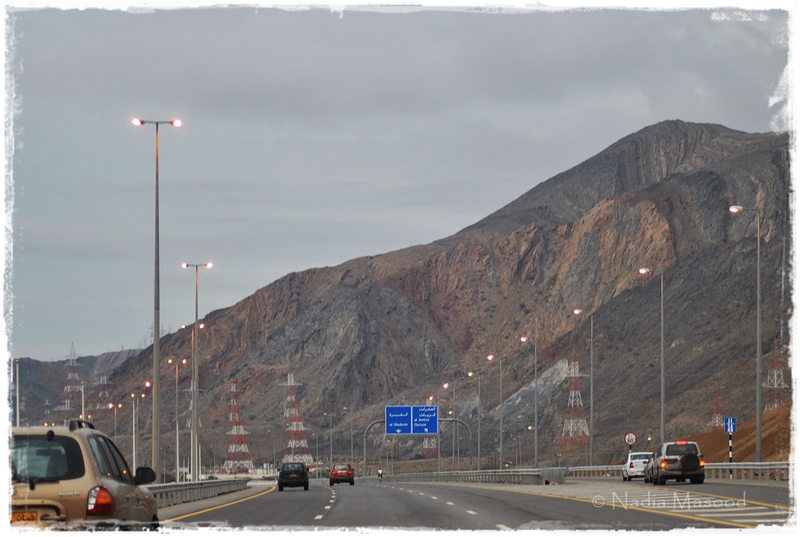 We took the Emirates Road (E311) and drove straight until we approached a roundabout. 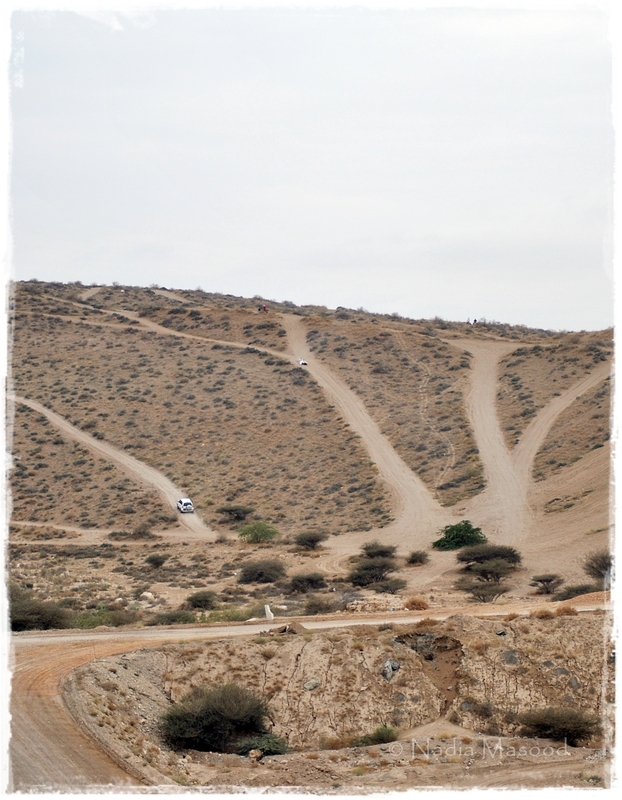 Take left (the sign says ‘Umm al-Quwain’). After some time, you will see the Ice Land water park on your right. Keep driving until you see some whale statues on your left. Take right and drive straight until you see the town on your right. 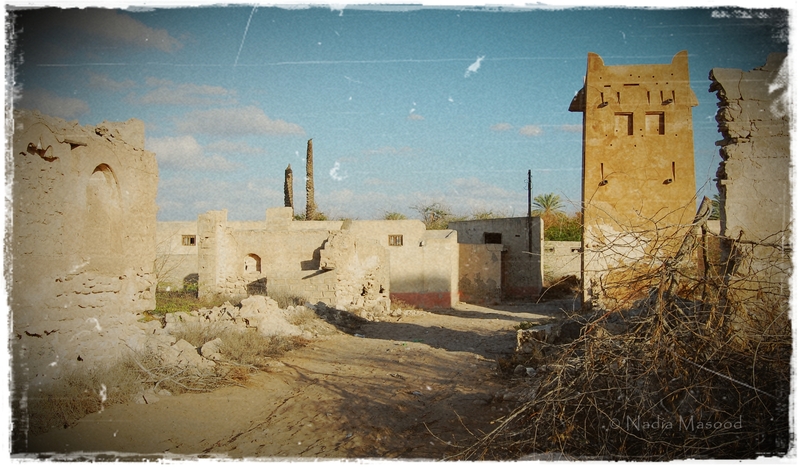 You can also read this account about Ras al Aisha al Shareef, whose ancestors once lived in this very town. And I’ll tell you all about this place. And why I’m here. 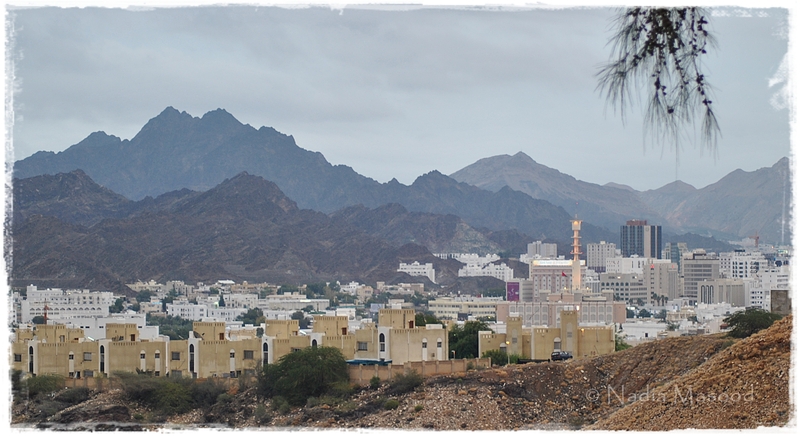 After crossing the UAE-Oman border, the long (and seemingly never-ending) drive and spending some time admiring the white houses, we finally drove straight into the Muttrah—one of the largest seaports and commercial area of Oman. We arrived around 6pm, tired and hungry. 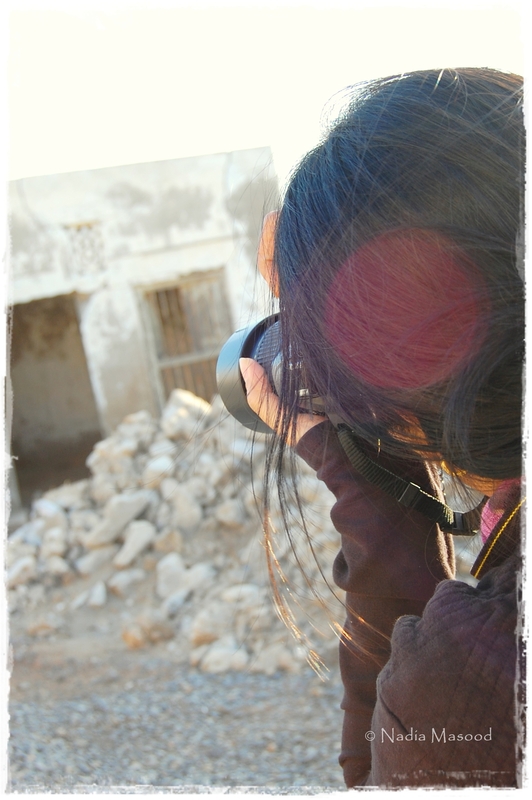 So we woke up early the next morning—a difficult task—to explore the place and take pictures. 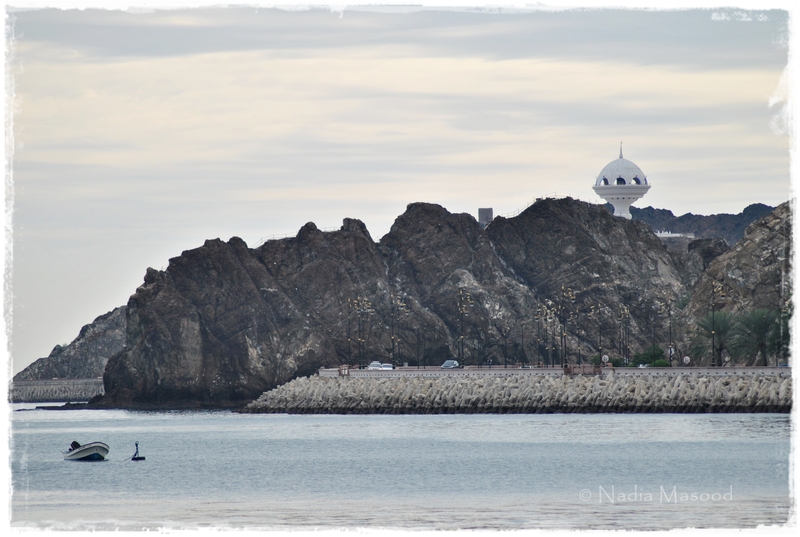 We loved Muttrah. It’s also called the Old Muscat, and it felt like we were in a totally different time. 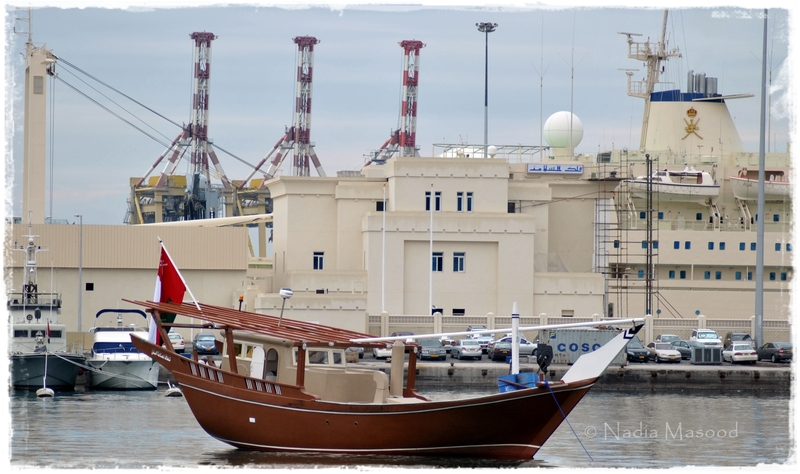 Did you know that this port was once occupied by the Portuguese? 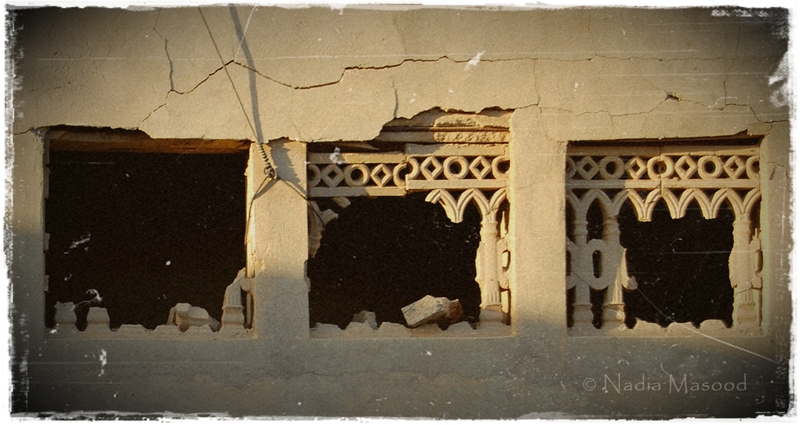 By the 17th century, however, the Omanis have had enough of them. They not only kicked the Portuguese out of their ports (and country) but controlled trade and territories along the African, Iranian and Indian coasts up until 1970. I find these fish rather disturbing; they appear to be eating each other! 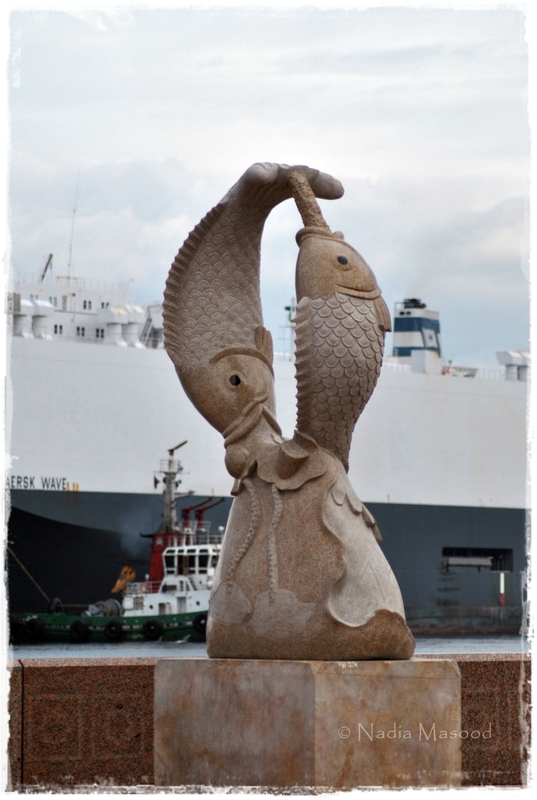 There are several fish-themed displays such as this along the entire corniche. 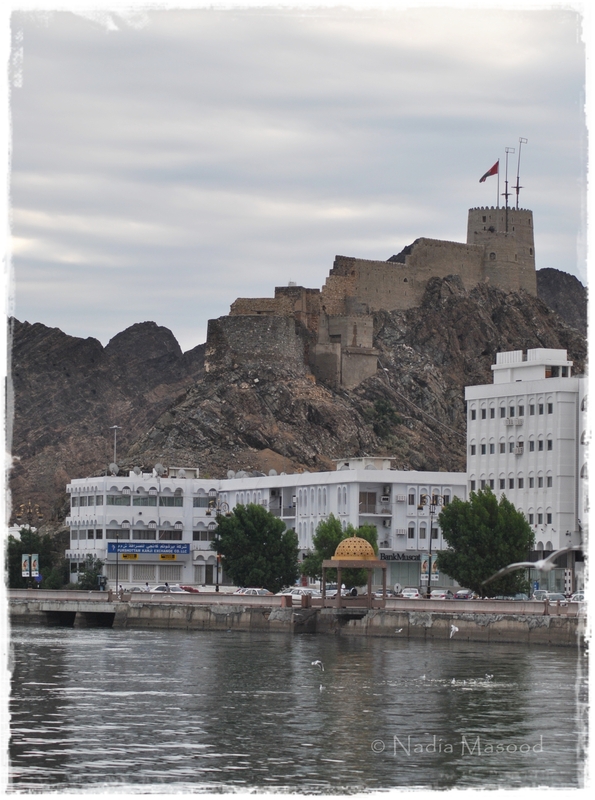 And the famous Muttrah souq is also located nearby. 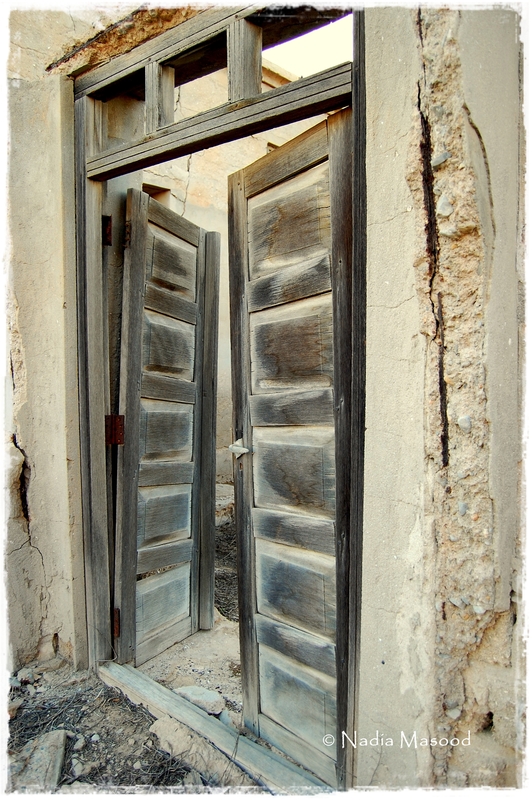 Pressed for time, we opted not to venture into the souq. But you can read all about it here. Another dilemma was finding an inexpensive hotel to spend 8 hours in. When we checked online, the cheapest rate we could find was 20 riyals (200 dirhams) per night for a one-star hotel, without breakfast. That was still expensive for us because in Dubai or Sharjah, one can find a three-star hotel with that rate! Traffic that evening at the Muttrah corniche was bad, so we parked our car and walked around to check the nearby hotels. There are several hotels facing the corniche. 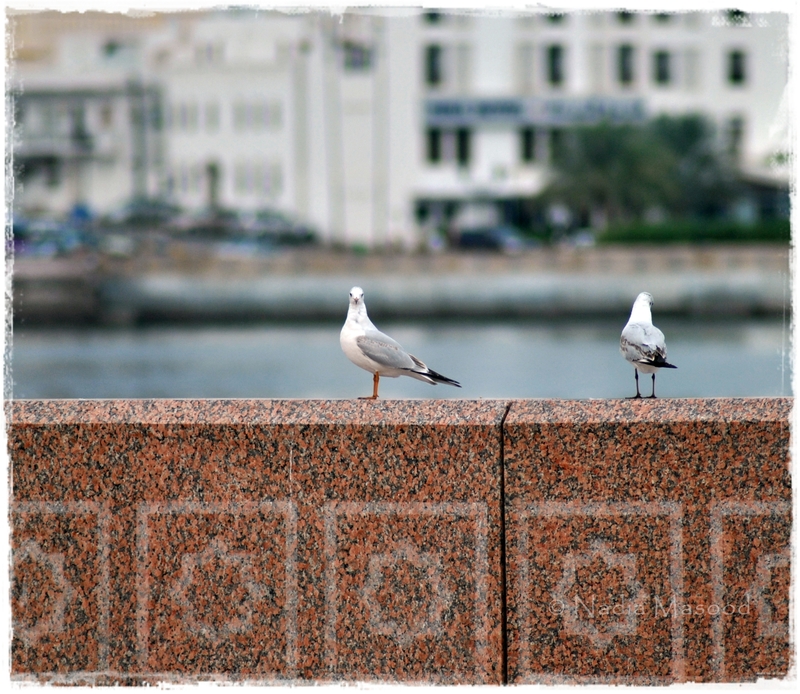 We went and saw three, then finally decided on the Corniche Hotel. It’s also a one-star hotel. 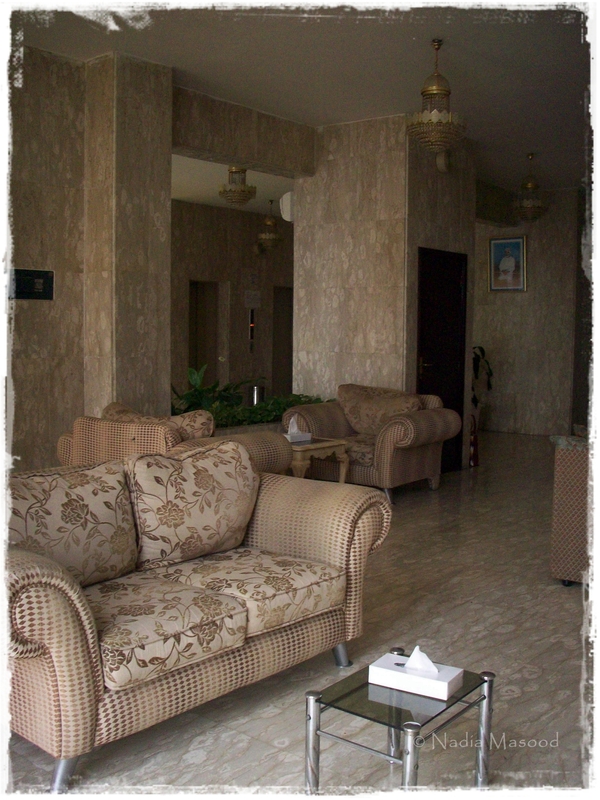 We had a double room for 15 riyals (17 riyals, if you want breakfast) inclusive of taxes. The staff and their manager were all very friendly and polite. And the rooms, although very basic, were really clean. I had a very restless night, tossing and turning in bed due to severe headache, and by 4 am the phone began ringing—I felt like my head was going to explode with the sound—and turned out to be a wrong number. A couple of hours later, Masood left to pray faj’r in a mosque just a few steps away from the hotel. I couldn’t muster the energy to go lock the door, and I didn’t want Masood to lock me in either. My sisters were asleep in the next room anyway, so I asked him to leave the door unlocked. Masood returned with breakfast. 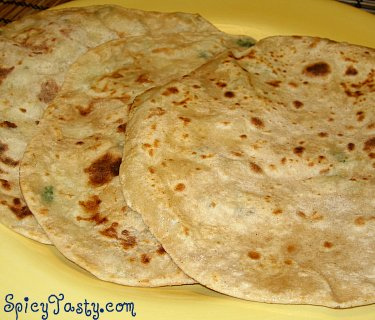 “How much?” I casually asked, opening the plastic container filled with choley and dipping a piece of paratha in it. “Five hundred? !” I choked on my paratha. “Five hundred baisas,” he said. “Oh. Why didn’t you say so in the first place,” I resumed eating. That is a very large incense burner of Riyam Park. Some tourists initially think it’s a space ship. It is officially named Masjid al-Rasool al-A’tham or the Mosque of the Great Prophet. 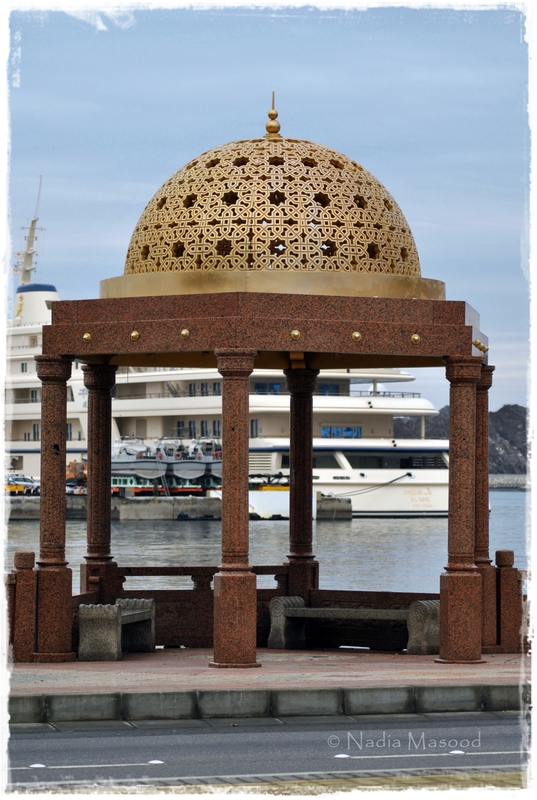 Its striking mosaic-covered dome and blue minaret dominate the skyline of Muttrah. This mosque is the central place of worship for members of the Lawati community. 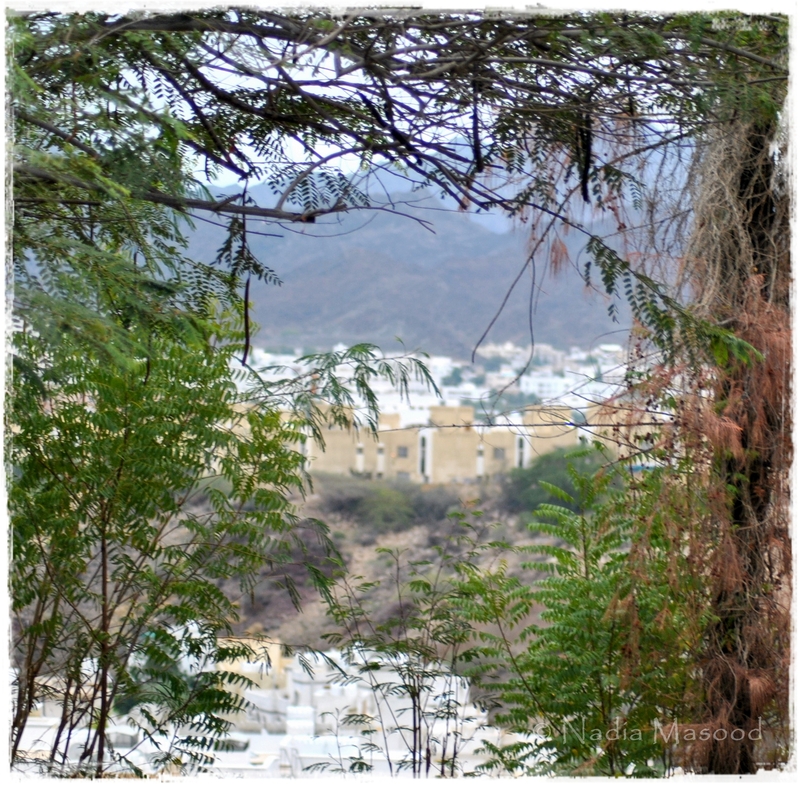 Perched on a rocky hill and overlooking the town, this is one of Oman’s oldest forts. Originally, this beautiful sixteenth century fort was built by the Portuguese during their occupation and was used for keeping prisoners. We tried to find ways to climb up, but it appeared like it has been closed down to public for safety reasons. 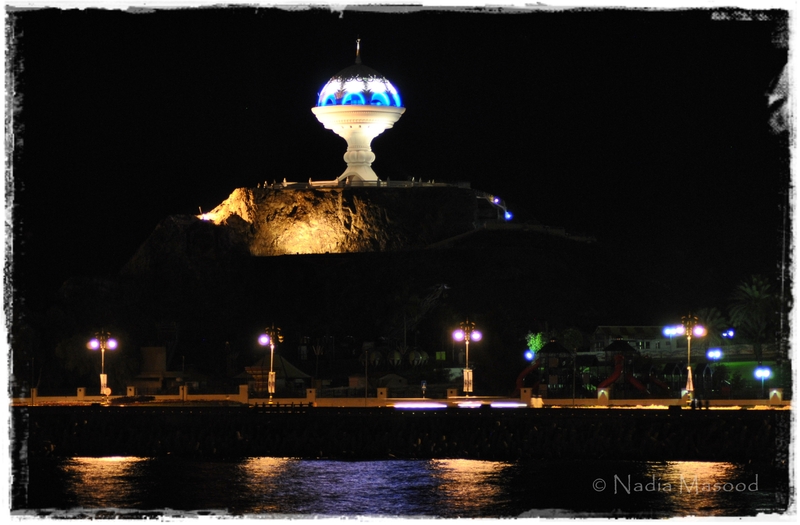 Overall, Muttrah Corniche is a must-see for anyone who’s visiting Muscat. Parking is not an issue at all (at least it wasn’t for us, and we were there on a weekend). And if you don’t have your own car, there are lots of taxis available. The only thing that we had a hard time finding was a decent desi meal. 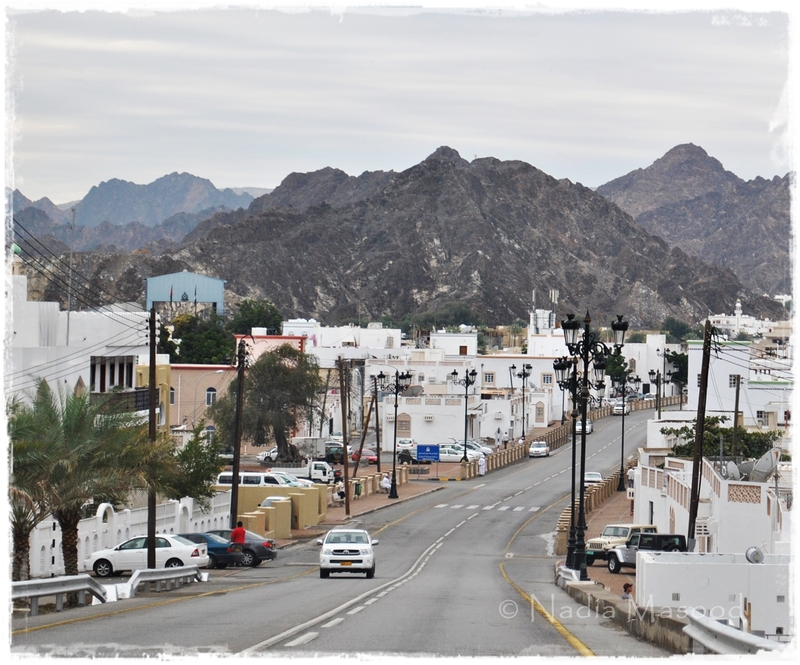 One of the first few things that we immediately noticed upon entering Muscat, Oman’s capital city, is the abundance of white houses. The following shot was taken by my sister, Sophia, the proud owner of the Nikon D3000 that we used throughout this trip. 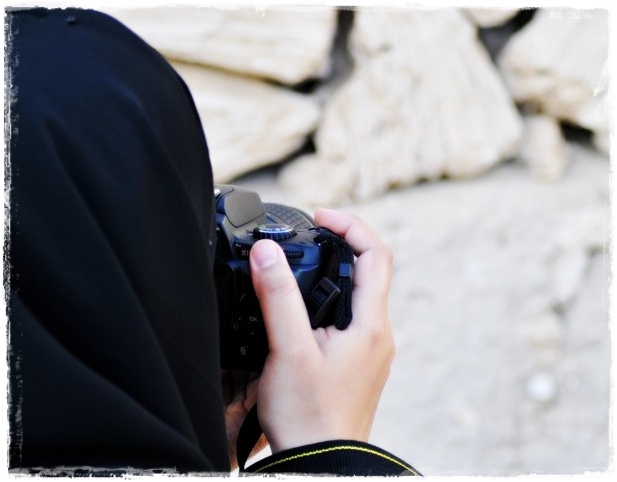 We—Sanaf, my other sister who is also my photography buddy, and myself—kept Sophia busy behind the wheels as we took charge of the more difficult task at hand: photography. Masood had less pressing matters in his mind, like finding us a hotel to stay in, for example, since we didn’t book beforehand. We didn’t even know where the hotels were located in the city. Where was I? Oh, yeah, I was showing you this photograph taken by Sophia. Did I tell you that she isn’t the least bit interested in photography? She hardly took four pictures throughout the trip. One of them was this one. She’s better at sketching, while I’m better in photography. Life is fair. 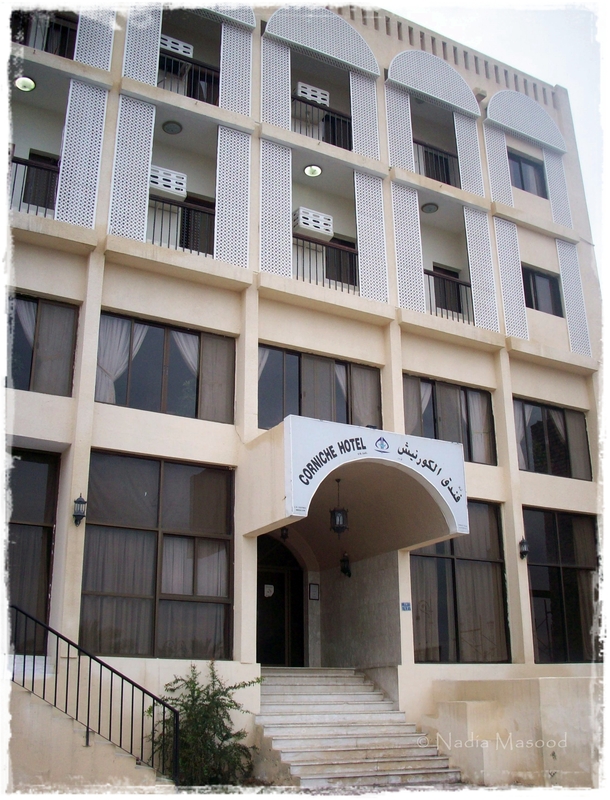 These low-lying white houses typify most of Muscat’s urban landscape. “Wow, this looks like Greece!” exclaimed Sanaf, who has traveled to Europe several times. “Oh yes, it does!” the rest of us agreed, without the slightest idea how the houses in Greece looked like. Not having skyscrapers obstruct our view was a pleasant change. We—the residents of the UAE who cannot imagine a building without a construction crane sitting on top of it—felt so liberated, like we were able to breathe. And if Dubai is clean, Muscat is even cleaner. 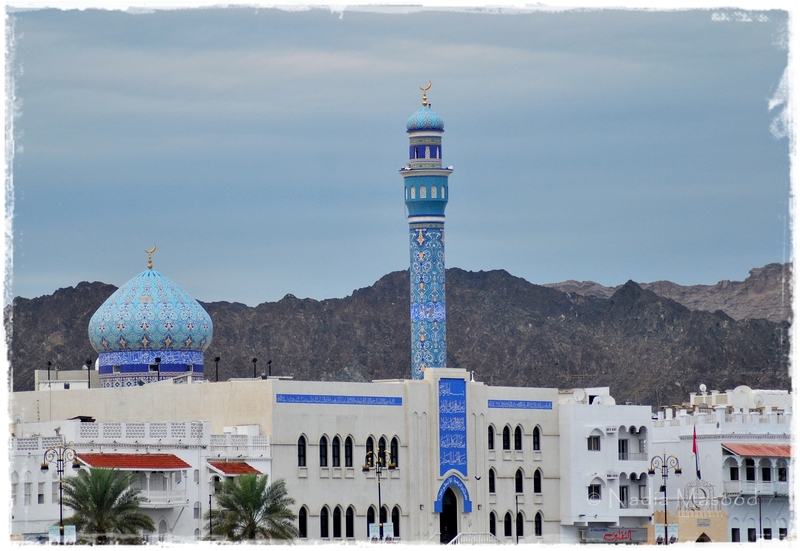 After driving for what seemed like years, we finally saw signs of Muscat. 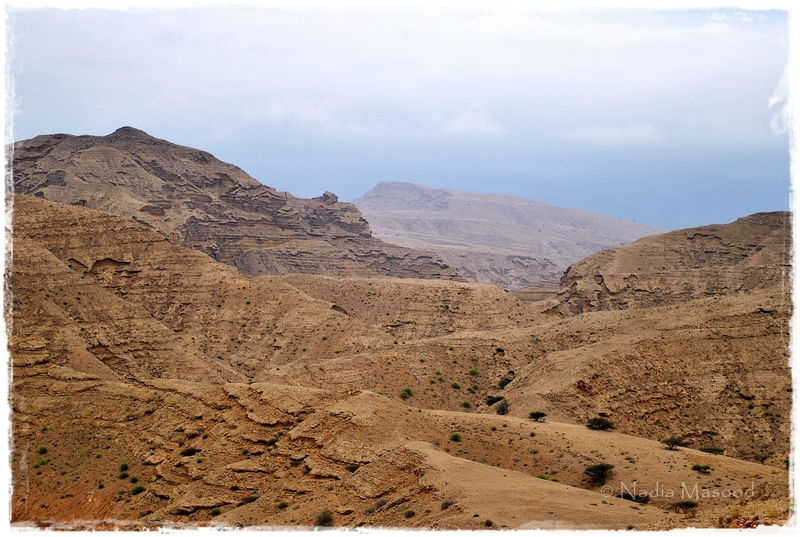 It rained on and off since we crossed the UAE-Oman border at Hatta, and this slowed down our speed considerably; that, and the fact that we stopped for tea, prayers, money exchange, and photography. We couldn’t help it. The mountains were spectacular! 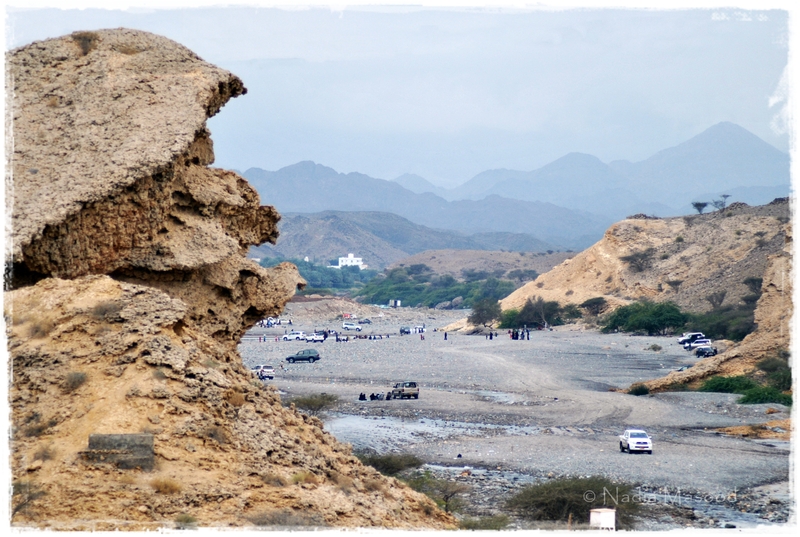 For a huge part, the highway to Muscat (and the city itself, as we would later discover) has been carved out from these very mountains—these imposing, strong and solid pillars of nature. And somewhere between these mountains was a place where people went with their families to enjoy a picnic. We stopped for a moment to watch them. A group of young girls were playing football. There was also a narrow stream of water in which some children were cheerfully splashing about; the cool January wind carried the sound of their carefree laughter all the way up to the highway where we stood. 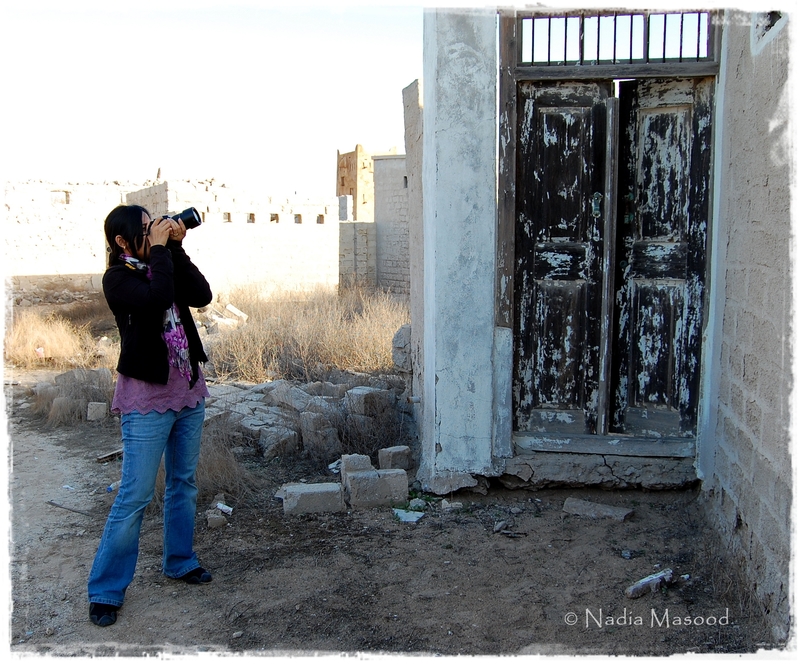 We were driving towards Muscat when we saw several cars parked on the side of the highway and curious-looking people taking photographs and videos of something that looked highly interesting. We immediately pulled over. We were, after all, tourists and must, therefore, indulge ourselves in all things touristy. They would drive really fast, aiming to reach the top, where some of their friends stood. Getting up there on the first attempt must be a great achievement; we observed that most drivers reached the top after multiple tries. 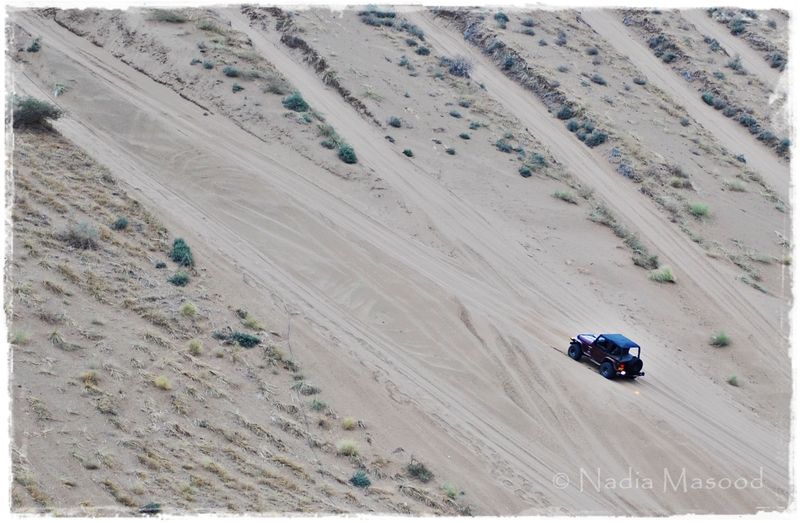 If one got stuck in the middle, he would bring the jeep down in reverse and try again! Here’s a small clip of this crazy driving. 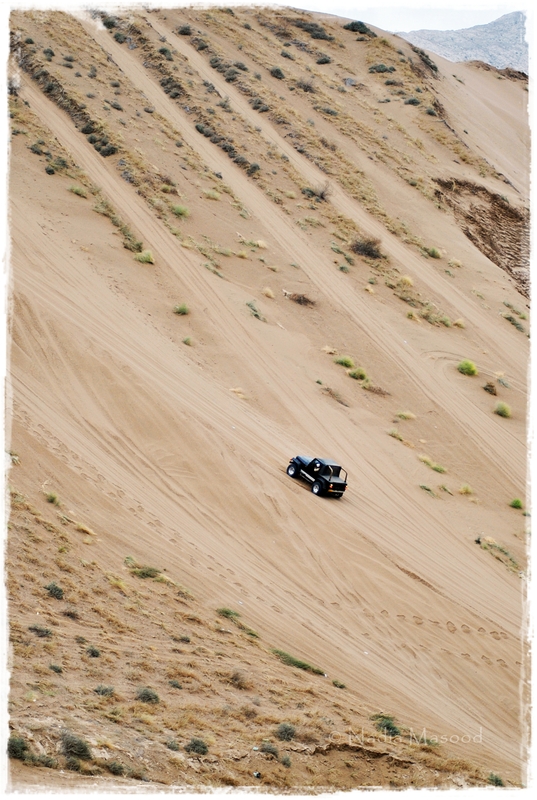 That first jeep reached the top on the third attempt. Oh, and pardon the voices in the background; the spectators were merely fascinated by what they were seeing.